Over 200 years ago Jeremiah Colman founded Colman's in Stoke Holy Cross, 4 miles outside of Norwich. Passionate about good food and strong flavour, Colman's continues to commit to using great quality ingredients to make the best flavour enhancers for your food. Try Colman's deliciously hot English Mustard, perfect with your Roast Beef. 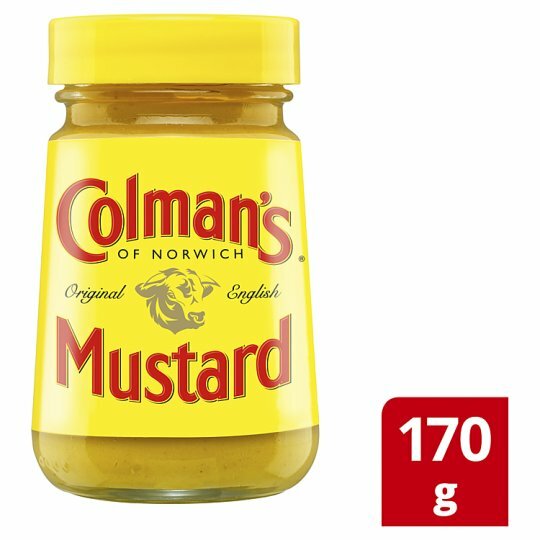 Colman’s Original English Mustard is a hot mustard that will add big bold flavour to your favourite dishes. Colman’s English Mustard is the perfect accompaniment to your Roast Beef and Ham Sandwiches. It also makes for an excellent punch of flavour in many recipes such as devilled eggs, salad dressings and mashed potatoes. Keep a jar of Colman’s English Mustard on hand to transform your everyday meals from simple to spectacular. If you love our English Mustard, why not try the rest of our range, including Colman’s Mint Sauce, that’ll add a zing to your Roast Lamb. Colman’s Cranberry Sauce, a fruity addition to your Roast Chicken or Turkey. Colman’s Tartare Sauce, perfect with your Fish and Chips. Colman’s Horseradish Sauce to add heat to your with Roast Beef. Colman’s Apple Sauce for a sweet addition to Roast Pork. And Colman’s Seafood Sauce for creating the best Prawn Cocktails. Head to our website – www.colman’s.co.uk for more exciting recipe inspiration across our full dressings and recipe packet range. You can also take a look at our broad Colman’s product range, where you can find tasty new products and recipes ideas for mid-week meals, decadent roast dinners, simple sandwiches and much more! Keep in a cool, dry place. After opening keep refrigerated and use within 3 months. Do not freeze.